I love this place! Just around the corner from the White House, the Old Ebbitt Grill was a favorite of Presidents in the late 1800’s. I love the clubby feel of the building, the booths with velvet upholstery, the dark mahogany wood, the coat rack hooks between the booths, the bustle and energy level still high at 9:30 and 10:00 pm. We thought the food was quite good; nothing to right tomes about but it fit the bill for what we were looking for as a late evening casual dinner. The lump crab cakes were delicious and were 95% crabmeat. Raw oysters are a specialty and were a treat. Steamed mussels with fennel, kalamata olives and a tomato-saffron broth served over linguine – excellent. Many other tried and true American specialties are on the menu. I highly recommend this restaurant for its ambiance and location - especially late in the evening in the winter as the snow is starting to fall. If this should happen to you, as it did to us, make sure to make the short two block walk to the front of the White House to have your own private viewing in a silent winter setting. 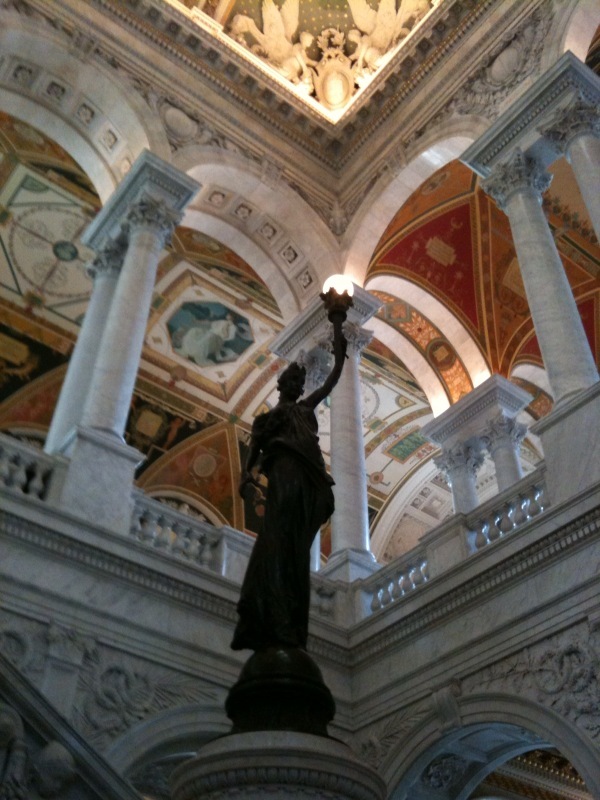 I decide a visit to the Library of Congress might be just the thing to give a boost to any latent writing talent – talent I’m sure just waiting to ignite with some outside catalyst. I should walk from our hotel, it is only about 1 ½ miles, but as I start walking I am a bit shocked at the temperature. I’m just not used to it yet, so I hop in a cab. Anyway, some of these cab rides are worth much more than the convenience of the ride. This was a quick trip but my cab driver and I exchanged tips on how to sleep through the night. The Library of Congress is an impressive, beautiful building inside and out. Gorgeous murals, art, architectural elements - but where are all the books?? This is more like a museum than a library. 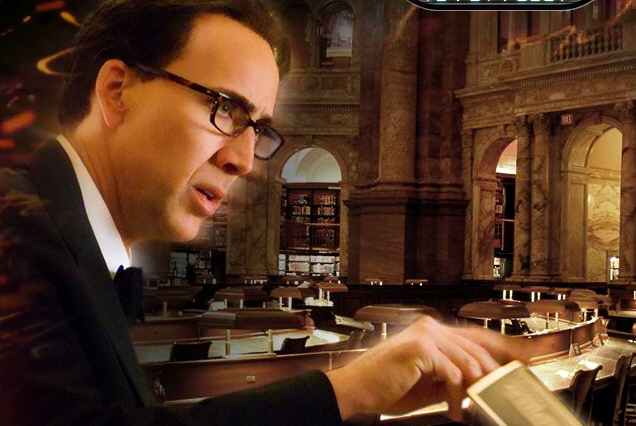 I don’t get any literary vibes until our tour group gathers in a glass fronted alcove and can peer down three floors into the library’s main reading room (the one used in the movie “National Treasure” and “All the President’s Men”). This room is what you think about when you think of the great libraries of the world. It is a fabulous many storied dome room with reading and working areas on the ground floor for “researchers” to request their books or other library collection items and where they must use them - nothing can leave the library. Visitors aren’t allowed into the library’s reading rooms but this is where I want to go and sit and ponder and let creative thoughts flow through my fingers onto a page…. Researchers can gain access by going to room L147 in the adjoining Madison building to apply for an official library ID. I am not sure if I qualify for the researcher classification but I decide to give it a try – I really want to experience that reading room! It takes some walking through tunnels and corridors and so I have plenty of time to think about a plausible research topic. I decide on: “History of Anabaptists in Switzerland”. This subject really did come up several years ago in the course of research into my family’s genealogy. It sounds fairly scholarly, not too normal, and fairly useless – perfect research topic. They would certainly go for this. But no one even asks what I will be researching. And I would have sounded so impressive! Oh well. So without incident I get my very official photo ID (good for two years) and then thread my way through the tunnels back to the Jefferson Building and finally find the entrance to the main reading room. I show my new ID and they let me walk right in! I decide I should try to give the impression, at least, that I am researching something or they might kick me out so I first step into the card catalog room (all on computer of course) and look up my brand new research topic and good grief – there actually is a book titled: A History of the Anabaptists in Switzerland – amazing. I print out the call number and information and then walk across the hall to the beautiful main room and very quietly ask the nice man behind the counter what to do, fully expecting him to tell me I am a fraud and shoo me away. But he is quite nice and has me fill out an old fashioned little slip of paper with the call number and my library card number and then I find a charming little carrel in which to sit and wait for my book to come from who knows where. I envision conveyors like airport luggage belts on which books would arrive from all parts of this large complex of buildings. But fortunately, as befitting this historic structure, a little lady comes every so often into the room pushing that same kind of library wooden cart that I remember from my childhood. During the hour or so I wait (yes, it apparently takes quite a while to retrieve requested books – I suppose with 33 million volumes it would be quite a task to fill requests, even though I don’t see more than about 10 people in this room), I expect any moment the literary enlightenment that must come from being in so august a place as this. I wait and wait. I find I have no brilliant thoughts to scribble on my scrap paper. And my requested book still hasn’t come after an hour (it usually takes about 45 minutes to retrieve books, but they are a bit behind today I am told when I inquire). But I feel quite assured, even though it might take a while, that this book is safe somewhere in this complex of buildings, and it is available for anyone. Just not for me on this particular day. It is late, I am starving and I have accomplished my goal of sitting in this wonderful room. I also realize that with on-line resources and inter-library loans, there is no real reason to come to a particular library. I suppose a physical library might one day be a thing of the past. I may not have experienced any personal literary enlightenment being on-site but I have came away from my visit with a very clear appreciation of how important it is to have a symbolic presence to remind us of what books represent and how important the written word is to our democratic society. The Library of Congress is the largest library in the world. The collection of more than 144 million items includes more than 33 million cataloged books and other print materials in 460 languages; more than 63 million manuscripts; the largest rare book collection in North America; and the world's largest collection of legal materials, films, maps, sheet music and sound recordings. Every day approximately 10,000 new items are added to its permanent collection. There are fascinating exhibits always in process (right now the one on maps is notable.) Ordinary people like me, members of Congress, researchers, and governments from all over the globe rely on this, our Library. I highly recommend a visit. Our meal was quite good and our particular server charming. But it seems that this is typical for Hawaii – everyone is charming and friendly. Merrimans has a wonderful Mai Tai – their secret is fresh pineapple and lime juice. We also had the Talley Chardonnay - which we’ve had before but this reminds us that we like this Chardonnay and should have some on hand at home. We of course try the ahi tuna many ways. My children don’t really remember their last luau. So we decided we should experience this special event on this trip. And this will do until they have children…. I must say how very impressed I was with the food at the luau. It can’t be easy preparing quality food for hundreds of people but the Mauna Kea does it well. Shrimp, sashimi, ahi poke, various salads, Island fruits, roast pork, roast turkey, teriyaki steaks, grilled Island fish, mashed potato and taro, poi, and lots of delicious desserts - and all in such a spectacular ocean side setting. The food was so good I hated to see it served buffet style. You just can't fully appreciate and enjoy each dish. Served in courses, presentation Monettes style, and this would have been a standout meal. Dinner in this beachfront setting, with swaying palm trees, a striking sunset, tiki lights creating a romantic ambiance, and gentle waves rolling in only yards away is a perfect end to our brief vacation. The theme of all our dinners has seemed to be Mai Tais and ahi tuni served raw, seared, and in a poke. Brown’s does not disappoint. Cut the tuna in to ¼ inch dice and place in bowl. In another small bowl, blend the oil, lime juice, wasabi, soy sauce, Tabasco, salt and pepper. Pour over tuna. Add the scallions and jalapeno. Cut the avocado into ¼ inch dice and fold very carefully into the tuna mixture. Allow the mixture to sit in the refrigerator for about an hour for the flavors to blend. Serve with large krinkle cut potato chips (excellent with this recipe!) or crackers. I had sworn never again to go to Hawaii at Christmas time. Our experiences in the past in the holiday season have been of too many people (and lots of children…) and not great weather. I gave in this year. But I fortified myself with low expectations – especially since hotel rooms were scarce as this was a bit of a last minute trip. The Hapuna Beach Prince Hotel on the Big Island turned out to be not our kind of place. After a few nights we ended up moving to the Fairmont Orchid and splurged on a first floor beach side suite. I love to be able to come and go from the sliding lanai doors right to the beach or bar or pool. I felt like this was my own little spot of paradise (well - to which I’d invited 100’s of guests…). Service was excellent at the Fairmont in all expected and many unexpected ways. When I perused the menu at Monettes at the Mauna Kea Beach Hotel I was quite impressed and immediately said to the family that this was one of the most promising menus I have seen. Well, we soon realized the power of marketing and presentation. etc., etc., etc. I really didn't know what most of this was but it sure sounded yummy. But…. The oysters, which were so tiny any sauce would overpower their taste, were served with three, albeit cute, little bowls of sauces that tasted like they were mixtures of a few bottled ingredients. The Mosaic of Ono and Ahi appetizer was cute (little squares of the two fish put together like a checker board) but not that tasty and what and where is the lemon caviar? My gazpacho had three, cute again!, Asian soup spoons filled with the typical crouton, tomato and scallion garnishes - nary a shaven salted radish or niçoise olive powder in sight. (I know, I know - a shaven salted radish – what does that add? But it sounded so nice). Then the Sher Farms Wagyu beef (an Australian high quality beef on a par with Kobe beef from Japan) was fine but the “truffle reduction” that my son requested as an accompaniment was, yes served in the same cute miniature white bowl that seemed to accompany every dish, but alas without a whiff or hint of truffle flavor. But I hate to be such a naysayer. And perhaps it was just that the menu wording was so well done that our expectations were too high. I can truthfully say that the meal ended on a high note. We ordered regular coffee. And of course it was served with another cute plate (I think it was a deviled egg serving platter – very clever) filled with different items to put in or have with your coffee. But in spite of the nice presentation of which I was now wary, the very smooth Kona coffee was excellent!